Matthew Shipp has been busy recording with at least a half dozen albums featuring Matthew Shipp including The Uppercut (ESP-Disk) with Polish reed player Mat Walerian, Live in Sant’Anna Arresi, 2004 (AUM Fidelity), a duo release with the late David S. Ware, the Bobby Kapp duo recording Cactus (Northern-Spy Records) and The Core Trio Live Featuring Matthew Shipp (Evil Rabbit Records). All vastly different in their aesthetic, further proving Shipp’s versatility. The trio is comprised of bassist Michael Bisio, a regular Shipp collaborator, the two have established a synergistic work relationship even though Shipp approach is often asymmetrical. Drummer Newman Taylor Baker joined Shipp’s trio with the release of The Conduct of Jazz (Thirsty Ear, 2015), who as Whit Dickey’s successor, the match has proven to be an astute choice. The piano solo “Links” begins the albums introspective motif, a wonderful set for the hard-bop “Cosmopolitan,” which primes the listener for what is to come. Strikingly unique are the compositions “Blue Desert” and “Void of Sea” while “Microwave” and “Gravity Point” are quickly paced tunes, with block chords and angular lines for a more impactful effect. The title track “Piano Song,” is the closing piece and takes the listener back to a pensive finish just as it was introduced, so is it closed out. Creative a calming send off to a diverse program. Like many of his previous recordings over the past 3 decades, Piano Song has deepened the visionary of Shipp, on this, his final recording for the Thirsty Ear label, it has been announced he will continue on as the label’s Artistic Director, continuing to shape the catalog of matchless recordings, I for one, look forward to hearing more from the catalog forthcoming. 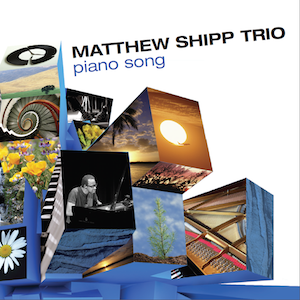 Be the first to comment on "Matthew Shipp Trio | Piano Song"